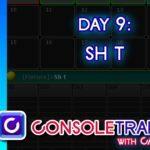 – The Consoletrainer 2018 showfile (Includes our updates up through Day Seven) so you can play along. 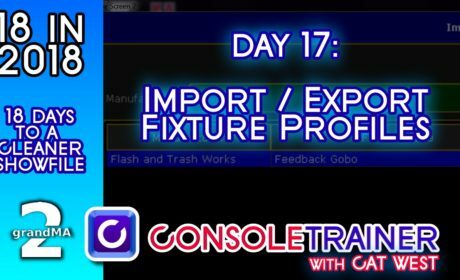 Our eighth day of 18 in 2018 is going to cover swapping gobo images in our fixture library with custom images of our own. If you’ve ever loaded a custom gobo into your fixture and wanted the icons on the MA to reflect your gobo- you’re in the right place. As always, lets start with backing up our show and renaming it to reflect the day. 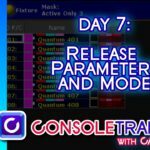 If you don’t have the showfile- take a second to download it from the link in the YouTube description, or at my website, consoletrainer.com. There is one additional item you’ll need to download today, and that is the Gobo bitmap that we’ll use for practice. You already know that the libraries in the MA2 contain bitmaps for the stock gobos for many fixtures on the market today. These images show up in the preset pool, and in the programmer and Layout views; if you choose. However, if you load custom lithos into your fixtures, the console won’t have that information. 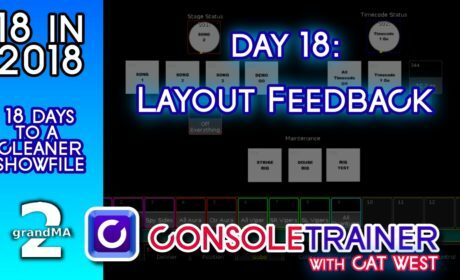 But, if you have digital images of your gobos, we can load those into our showfile so that the thumbnails will reflect what we have in real life. First, lets look at where the gobo images can be accessed to be changed. Press SETUP and enter the Patch and Fixture Schedule. Click “Fixture Types.” Here, we want to click on the light whose gobos we wish to edit. Let’s click the Vipers and then “Edit.” Now into “Wheel Manager” and select “Gobo 1” followed by “Edit Row”. Now you can see and edit the gobo images on wheel one. The MA2 software has a file system full of gobo images where these are stored. Right click or encoder click on any one of the image fields to open the folder tree. Now, you could pick any image you want to associate with that slot in the unit. At this point, our custom image isn’t here, so we need to load it- and it has to be loaded into this file system. For this example, we’re going to load our gobo into onPC using the Windows file system, but if you’re on a console, you’ll need to FTP to access the folder. I’m including a link with the instructions to do that in this article, along with a link to my favorite, free FTP program: Filezilla. So, you should have the custom gobo file somewhere accessible on your computer or thumbdrive. We need to place it in the correct folder, so open your computer’s hard drive and look for the “Program Data” folder. Please note, that if you do not see the “Program Data” folder, your system may have it set as a hidden folder. The instructions to view it are slightly different depending on your OS, so I’ve included a link with simple instructions in my post. In the Program Data folder, we want “MA Lighting Technologies.” Select “grandMA”, followed by the software version folder that we’re using (3.3.4). In here, find “Gobos,” and lastly, the “User Gobos” folder. I’ve got a couple of user gobos already sitting in my folder, but yours may be empty. Now, drop that downloaded gobo image into this folder. If you have a different image to use, that’s fine, too. I’d recommend keep the bitmap size small and square. 128×128 pixels works best. Now we can close the folder tree and move back to onPC. Let’s say we want to change the Limbo gobo to our custom gobo. Right click on Limbo’s file cell to open the selection window. Clicking this folder icon will take us to the top of the folder tree. We’ll look for the Gobo folder, followed by the “User Gobos” folder. Now, you’ll see our “ExampleGobo” file- select it and click Open. There it is. You could also take a moment to rename this slot. Close all of the SETUP windows and make sure to save. 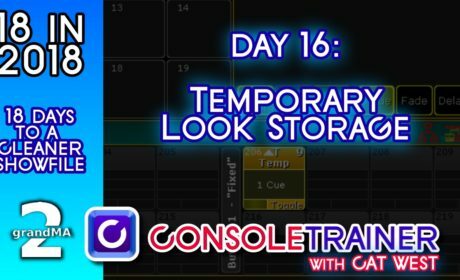 Now, take a look at your gobo preset pool, you’ll see that the icon for this slot has been updated, and that update will follow anywhere you see gobo icons in your show. That’s it!